In this Challenge, we will be demonstrating how you can add a non-map element to your page or website, so as to manipulate the map center and zoom on hover. 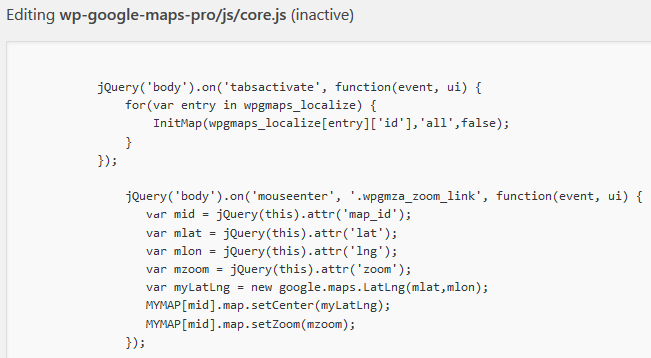 As this is a non-map entity, you can place it in your header, your footer or even as a link or button above or below your map (however, for the last mentioned elements you might need to alter your jQuery slightly – don’t worry, we will guide you through this). We will be showing you how to make these changes in a HTML image. You can alter this element to suit your requirements. This will allow your users to hover over the image on your website, to change the location and center of the map. This code can be altered in many ways. You can also have a “mouseleave” event in which the user has to move out of the image boundaries, before the changes take effect. You can also have the click event “jQuery(‘body’).on(‘click’…”, which will allow you to use a button to manage the process. To do this, you will need to slightly alter the HTML and jQuery code. We hope enjoyed this Challenge. If you have any questions, please get in touch with our support team. Thanks for this! Was able to modify the answer to create tabs that when clicked will move the map. I got some error on the zoom base on your coding, it seems the zoom value is a string, it need to change to integer, so I add the code to convert the string to int.